Every year, teachers spend nine to ten months educating students on many subjects. Of the many subjects, history, in particular, requires a good visualization of the events discussed to successfully understand the subject. However, many students are taught to memorize historical events. Reading and writing about a topic does not necessarily mean visualizing what is being taught. The teachers in our school try their best to give us visual examples while we are learning about something. They leave it to our imagination and interpretation, but we as students are sometimes curious to know what a fort used for war or battlefield looked like. To fulfill that curiosity, our school offered a week-long trip to Washington D.C. and New York to see America’s history. The trip provided us with visuals to link our knowledge and gave us a once in a lifetime opportunity to live America’s history. For example, we were told that America’s first president, George Washington, had a huge and extravagant house in Virginia called Mount Vernon. We were shown pictures of it, but we could only imagine what it would look like in reality, as pictures can only take you so far. 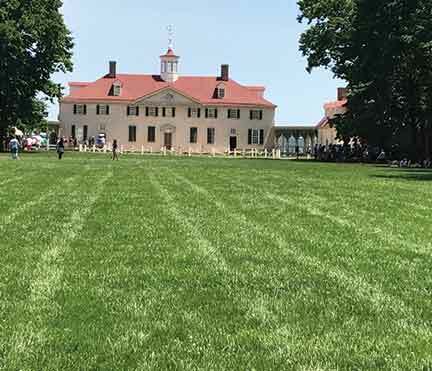 On the very first day of the trip, we were taken to Mount Vernon, and whatever I had learned about it, I was able to connect to what I saw. By seeing it in person, I truly understood what living conditions were like for a president living in the 18th century. The experience added so many dimensions to the textbook’s information, since I could finally visualize what the textbook was saying. Another topic, which happens to be taken very seriously in Texas where I live, is slavery. Slavery, like Mount Vernon, needs to be seen and experienced to get the right perception. I always knew how unpleasant slavery was, but when I saw the slave quarters at Mount Vernon, I realized how bad conditions were for a slave at that time. To learn that slave quarters were half the size of my bathroom and had no amenities made a huge impact on my cognition. Experiencing what was taught during the school year helped me develop a deeper understanding of the history and gave us students a reliable visual to link our schooling. Learning and hearing about historical places, events, and people is beneficial, but to see and live what we learned provided us with so much more experience about the topics. Seeing the various things we learned helped me grasp the history more effectively. We also got exposure to the conditions soldiers faced during the world war, how presidents were assassinated, how slaves could escape, and how people managed back in the day. This trip helped me learn more, experience more, and visualize more. Just one week made nine months of learning worthwhile, and seeing things in person made all the difference. The author is a 9th grader in Allen/Dallas, Texas. She loves to read, write, and play football in her free time. She can be reached at akanksha.murthy@gmail.com.